Here we have is a Reproduction 1884 Victorian bustle gown. I have used extra stiffening fabric to the back bustle to give it a extra lift. This gown is all handmade using black cotton velvet fabric with a dark purple taffeta fabric. For sale handmade ladies deluxe 19th Century Jane Austen 'Pride and Prejudice' open robe sleeveless over gown perfect for a Regency event. SALE IS FOR OPEN SLEEVELESS GOWN ONLY - NOT THE WHITE GOWN UNDERNEATH. Pretty design with sunflower. Once silvered I think, but mostly worn off. Good antique condition. BOATER WITH MATCHING VELVET BAND AND BOW AT THE BACK. VERY ATTRACTIVE. FASTENING WITH LARGE PRESS STUD AND 2 BUTTONS FOR DECORATION. 1 1/2 in WAISTBAND FASTENING WITH PRESS STUDS. BACK LENGTH 20in. SKIRT LENGTH 40in AT FRONT 42in AT THE BACK. Cotton - good colour. size uk 12. Label - kit. Black faux fur lace trim. black taffeta lining. Qiaoke fashion. Girls' Pinafore Apron in White Cotton. 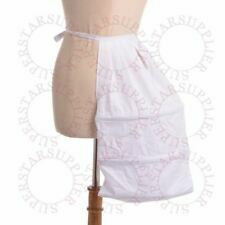 The White Cotton apron is professionally made to a high standard. anti pilling so will not leave those little bits which appear with. Machine washable at 40 degrees. The skirt is also longer at the back to give a slight train and also looks fab over a bustle. It has been worn to a Steampunk event as well with a leather gun belt and accessories. The bodice fastens at the back with lacing, similar to a corset. 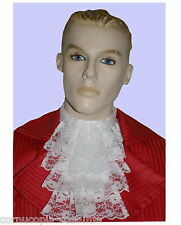 We specialize in designing and making historically inspired dresses, gowns and jackets. Victorian C hoice. We design and make our dresses and proudly present them to you. Similar pictures used by other websites are not authorized by us. Steampunk ~ Goth ~ Burlesque ~ Dita ~ Panto. Victorian ~ Regency ~ Fancy Dress. We're also more than happy to help with bulk orders. Depth: Approx.